The Senate Executive Committee voted on an amendment scrapping Illinois’ constitutional flat income tax protection. But lawmakers have yet to introduce a bill outlining what the rates would be. A blank check for state lawmakers is moving through the Illinois Senate. The Illinois Senate Executive committee voted 12-5 April 10 to approve SJRCA 1, which would eliminate the state’s flat tax protection, and allow for a progressive, or graduated income tax. That amendment would be subject to voter approval on the 2020 ballot. But who will pay more, and how much more, is still an open question. Gov. J.B. Pritzker has been pushing his proposed progressive income tax plan for weeks, which he calls a “fair tax,” but the proposal has yet to appear in bill form. Given Pritzker’s unwillingness to slow Illinois’ new spending and debt, and bad math from his administration, a graduated income tax would be a bridge to higher taxes for the middle class. First, Pritzker’s estimated $3.4 billion in new revenue from his progressive income tax plan would be enough to fund a mere four months of state pension costs. Only Pritzker has been able to work that math, with no outside group able to replicate his revenue claim. Second, his promise of income tax relief – which Pritzker has already walked back – would be wiped out by typical growth in property tax bills. Pension costs and other benefits, along with debt, drive the majority of Illinois’ property tax growth. States with progressive income taxes see slower economic growth and slower jobs growth than states without. Pritzker’s plan would clearly make the state less attractive for new investment. 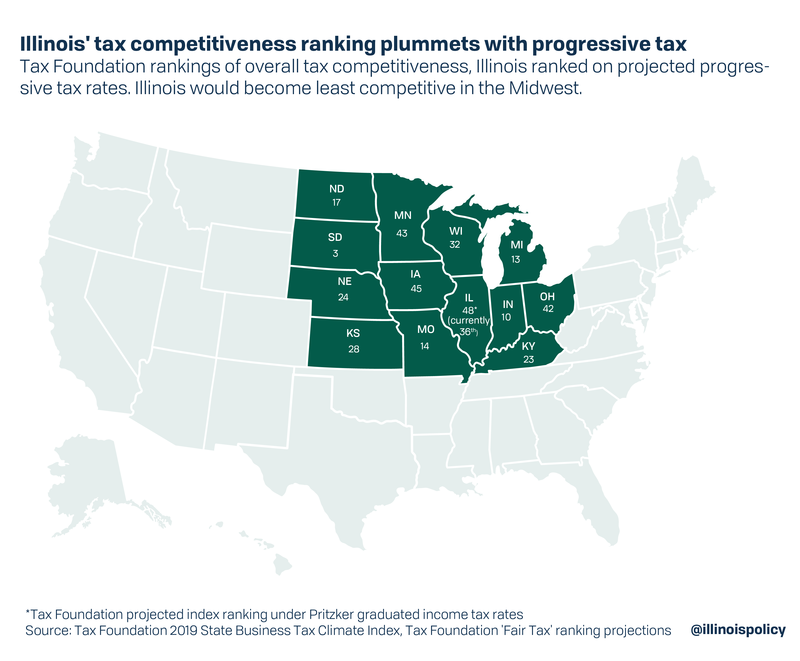 The nonpartisan Tax Foundation estimates the governor’s proposed rates would sink Illinois’ business tax climate to 48th of the 50 states. Finally, progressive income tax states are losing residents en masse to states that don’t levy an income tax. 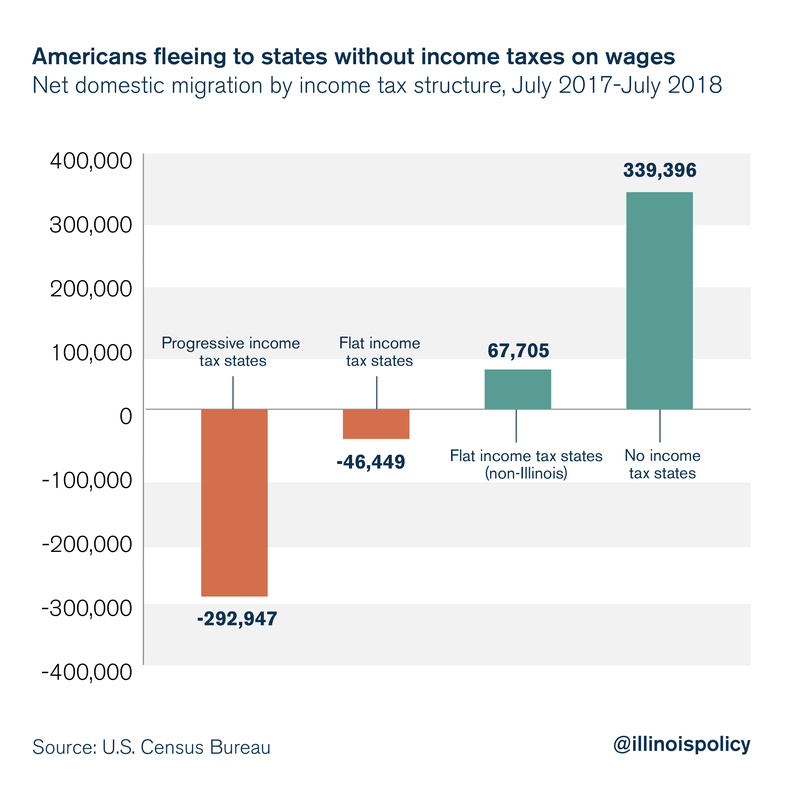 Progressive income tax states lost nearly 300,000 residents from July 2017 to July 2018 as a group. Meanwhile, states with no income tax gained more than 300,000 residents. And taken together, flat income tax states excluding Illinois also gained residents from other states. Pritzker’s goals – healthy state finances, a strong economy and a tax cut for the middle class – cannot be achieved by the means he’s proposed. Of these solutions, a spending cap – which already has bipartisan support in the General Assembly – would do the most to shore up state finances and prevent massive budget shortfalls exacerbated by rapidly increased spending. Lawmakers have two options ahead of them: They can continue to rack up debt and pursue tax hikes that will further damage the state’s economy, or they can break with past practices and pursue responsible budgeting that protects both taxpayers and core government services.